Sunscreen for the delicate, wrinkle-prone eye areas is a must, but there are other steps you should take to protect the skin around your eyes and the eye itself. We compiled our best, research-supported tips to keep UV rays from harming your eyes and help prevent visible signs of aging. Sun care for eyes begins with facial sunscreen. It must be rated SPF 30 and labeled “broad spectrum,” which means it protects skin from the two main types of UV radiation: UVA rays and UVB rays. Because the skin around the eyes can be more sensitive, look for sunscreens or for eye creams with sunscreen that contain only the mineral actives titanium dioxide and zinc oxide. Among sunscreen ingredients, these are the least likely to cause stinging, even if they get into the eyes. Wear sunglasses year-round, every time you’re outdoors, even if it’s cloudy—UV rays penetrate clouds. 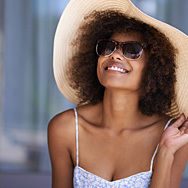 Look for sunglasses labeled as providing “100% UV protection” or those that have an E-SPF rating, which measures the amount of protection the lenses provide from UV rays. Sunglasses not only look great, but also protect the eyes from numerous health issues. When shopping for sunglasses, choose a wraparound style. This style protects your eyes and the skin around them from UV light that sneaks in from the sides and top of other sunglass styles. For long days outdoors, especially on sunny days, wear a broad-brimmed hat. There are many fashionable options, and they complement the protection you get from sunscreen and sunglasses. Any sunscreen for your face should be fragrance free and loaded with antioxidants. The wide variety of antioxidants found in non-fragrant plant extracts, vitamins, and food ingredients like green tea work in combination with sunscreen to help skin around the eyes look younger and resist further visible signs of aging. Consider using a concealer with sunscreen. You can apply this, or a gentle, mineral-based facial sunscreen, around the entire eye area, including on the delicate eyelids. Mineral-based sunscreen sticks are a quick and convenient way to reapply sunscreen around the eyes when you’ll be outdoors for more than a couple hours. To avoid tugging at eye-area skin, warm the product on your fingertips first and gently dab it around the eyes—then put those sunglasses back on! Eat foods rich in the antioxidants lutein and zeaxanthin. They’re found in leafy greens like kale and spinach, in orange bell peppers, kiwis, grapes, and zucchini. Research has documented their protective role when eyes are exposed to UV radiation.